Will continue doing it until the time to do it is avaible. For now it is but in the future, who knows. We had a very strong week. And it´s due in part to a gigantic number one, that was predictable but was still huge nonetheless. Another week, another number one. This week celebrated also the release, from ICAM, of the number in total of 2005, which i will analyse and do a overview of the market. It will be huge but also give me some time to process all the numbers. There were 327902 spectators in movie theathers all around the country for a 56% rise in number. What a week!!! Without further delay let´s analyse all the numbers. 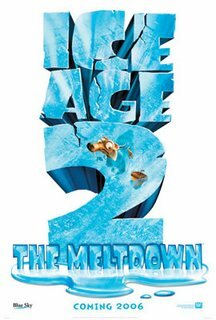 A little low on expectations, despite the gigantic opening of "Ice Age:The Meltdown". I know it means 153577 spectators went see it and that´s the biggest opening i ever announced on this analysis but i was still predicting 200000. And it didn´t go near it by a long shot. They say it´s better than the first, because what was good they doubled it (Scratch) and the bad they cut it altogether (human element). So it´s only us and the prehistoric beasts. Won´t go see this one but it really looks better. If you like animation go see it. It´s a no brainer. When there is a so big player in town the other new films tend to get even smaller that they would ever be. So in number 6 we find "Just Friends", the romantic/gross comedy of the week. And one that points the obvious. Holywood is running out of ideas in this department because in the next two weeks we have two comedies based in huge hits of other movies. Comeone people, new ideas. The fat guy who gets the girl. I´ve heard that before so this isn´t it. Ohh, right it made 15776 spectators for the week. Very "week" indeed. At number 7 we find Roberto Benigni´s latest effort on the preditable "The Tiger and the Snow". That doesn´t mean it isn´t good, just that it was done before, and probably better (can´t know for sure until i see it). It made 10451 spectators in only 10 theathers so that´s a very good perfomance and one that proves that Benigni is strong in Portugal. Out of the top 10 but at number 12 is "Breakfast in Pluto" in number 12. It made 4700 spectators in just 7 theathers. Not very impressive but the lack of critical acclaim of a film that needs it means fewer spectators. And the "Drag" theme doesn´t help it´s crusade. Cillian Murphy on the other end really helps the movie shine, they say. A actor´s movie, so. At number 2 we find the greathest holder of last week´s top three "Nanny Mcphee". The kid´s movies are back and not thankx to harry potter and alikes according to the critic Jõao Lopes. It´s all in Nanny´s shoulders. And the 12% drop speaks for itself. 32850 spectators in it´s second week can´t be wrong. Last week´s number 1 is at 3, this week. "V for Vendetta", with a 29% drop to 31030 spectators, it managed a very strong second week and some good legs, at least for the next week. At number 4 is "The Pink Panther" in it´s third week with the smallest drop (10%) and 28161 spectators for the week. The quality of the film is not very strong but still makes people go see it. The word of mouth is working for it. For how long? At number 5 we find "Casanova". With 27836 spectators and a 27% drop, it mantained some strong number considering it is not doing well where it opens. And the very low numbers in the U.S speak for itself. At 8, the most regular of the top 10 "Prime". With 30% drop and 10427 spectators, it´s destined to disapear next week. "A History of Violence" isn´t getting the crowd it deserves. In here and around the world. And it´s an acessible but deeply Cronemberg film. And that´s always a good thing. The 34% drop (biggest this week) and 9496 spectators, say otherwise. that´s a shame, really. Finally, closing the top 10 is "Underworld: Evolution", with 21% drop and 8298 spectators. Bye. The smallest drop awards goes to "The Nun" in it´s second week with a 7% drop to 4155 spectators. No explain for this, since it was voted the worst film of the year by critics, only 8 theathers. Could the critics be wrong? All 5 of them who did see it? Hardly. 5 is to much. But if next week it continues we got to think harder. "Crash" is about to finish it´s second run at number 19 with a 23% drop and 3030 spectators. Next week it´s a bye bye. i thought kelly macdonald was cute in nanny mcphee :)..
A foreigner commenting on my blog. That´s a first time so thank you for saying something. It means somebody out there in the world is reading this. I was thinking no but you proved me wrong.